Working a sedentary desk job, Staci slowly packed on weight and ate like a typical unhealthy American. She also smoked a pack of cigarettes a day. She tried to get in shape doing what many people start with: she ran a lot and essentially starved herself. She dropped to an incredibly low and unhealthy weight and developed an eating disorder. 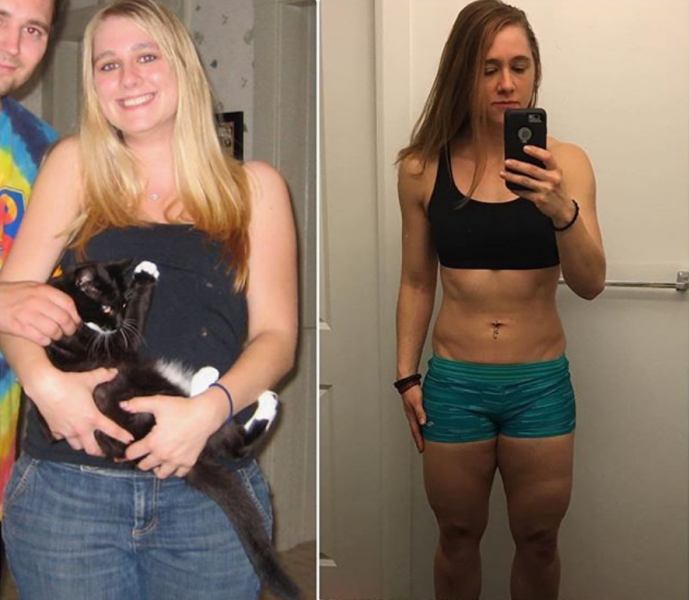 She fell in love with barbell strength training and started lifting HEAVY weights. She’s now in the best shape of her life, healthier and happier than ever before, regularly competing in powerlifting meets and deadlifting 430+ pounds! Now in 2019, her journey continues to inspire MILLIONS around the world. For the women out there who are scared about “getting too bulky when lifting weights,” this article is for you. In fact, she’s now our lead female trainer in our 1-on-1 online NF Coaching Program! Without further ado, here’s an interview/8-year-retrospective/how-to juggernaut of an article on my hero and yours, Staci Ardison! I’d get up at 7, go to work, have a Slim Fast shake because I never had time for breakfast. I wasn’t a big snacker but I ate a lot for my meals; I’d typically go out to eat for lunch every day and get a sub or something from D’Angelo’s or Subway, and it was never the 6″ one, it was the big one. And chips. Lots of chips. Or french fries. Getting home I’d either go out to eat with friends or plop in front of the TV playing video games for hours. My favorite meal was tacos and nachos. I just asked my old roommate what I used to eat because I didn’t remember, and she said “You used to sit in front of the TV with a big plate of meat and cheese and go ‘Hm, I guess I should have some chips with this. '” On many occasions, we’d order pizza or takeout around 11PM too. On top of all of that, I used to smoke a pack of cigarettes a day! Eat way less and run way more. She joined a gym and started doing the elliptical as much as possible (“because that’s what you do when you want to get skinny, right?”). STACI: At first I was only able to make it 10 minutes, but eventually got up to about an hour at a time on the elliptical. I always thought that being super skinny would make me happy, like it was the one missing piece of my life. Everything would just magically be solved if I could just be skinny. I bought countless exercise machines for my apartment, which all ended up sitting in the corner gathering dust. 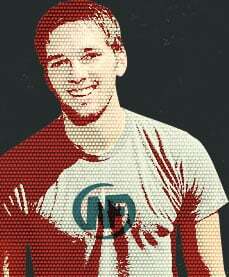 I bought DDR thinking that if I could exercise in a video game, that would do it. It didn’t. I even tried “Sweatin to the Oldies” (which, for the record, everyone should do, because it at least gets you laughing and moving). Nothing stuck. Until I was finally ready. I can’t say what it was, but I just got up one day and said: “OK, I’m going to do this now.” I didn’t set a date ahead of time, I just woke up knowing it was time. Along with the elliptical workouts, I joined Weight Watchers. But as I started to feel the effects of the weight loss, I got obsessed. I’d weigh myself every day; I got a scale that measured every ounce so I’d know exactly what I lost. How my day went was always based on the number that was on the scale. If I had lost weight, it was a good day. If I had gained, I was worthless and didn’t deserve to have a good day, and had to do a second elliptical session to punish myself. STACI: I did lose the weight that I needed to lose, but instead of “finding myself” and becoming comfortable in my own skin, I ended up being LESS comfortable. Everything I did was based on appearance. I couldn’t do certain things because either my body wasn’t “ready” or I was afraid I’d gain an OUNCE back. I started looking in the mirror and seeing 30 things that needed to change; I developed severe body dysmorphic disorder. 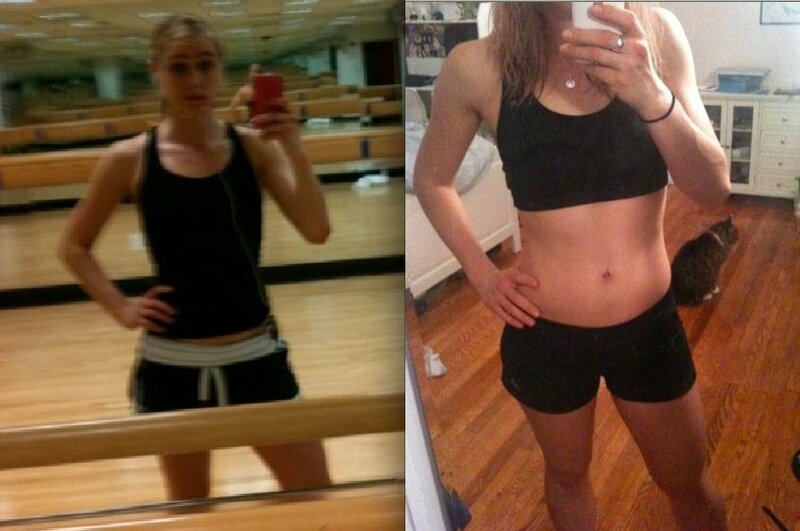 When the elliptical and calorie restriction stopped working, I became bulimic; I was just so desperate to be thin. I was tired all the time, I had no energy to do anything even when I was sleeping 10 hours a night. The bags under my eyes were insane. I simply wasn’t getting the nutrients I needed. It was at this point that I was dating a bodybuilder who informed me I was doing it all wrong. This got the idea in my head that there was a better way, and I started to research nutrition and strength workouts. I got a set of 5lb dumbbells and a Jillian Michaels DVD and tried doing pushups. I remember struggling to do chest presses with the 5lb dumbbells. And I wouldn’t use weights at the gym because I was so scared of looking like a fool in front of all of the guys on the weight floor. Seriously terrified. As I found more info on nutrition, I started questioning Weight Watchers, and finally stopped going after I asked a question on how something was healthy and he pulled the line, “we’re not trying to get healthy here, we’re just trying to lose a little weight”. I started doing more research and began my transition to eating more Paleo in April or May 2010. I upped my calorie intake to around 1,500 a day and immediately started to feel better. Because she was working out with coworkers and friends rather than random strangers, she felt comfortable giving strength training a try; she felt okay asking coworkers questions on different exercises and less self-conscious that she was doing everything wrong. STACI: I finished the Paleo transition in August or September, and stopped counting calories, which was one of the best decisions I’ve ever made in my life; it’s a freedom I can’t even describe. I just ate when I was hungry. I gained weight, but I stayed the same size clothes, so what the scale said started to matter less and less. I went from 110 pounds at my lowest to around 130 pounds (both pictured above) and felt GREAT about it. My scale broke in May of that year, so I threw it away and only weigh myself probably once a month these days out of pure curiosity. It was right around this time on her search for Paleo diet information that she stumbled across Nerd Fitness and saw an article about the Legend of Zelda (her favorite video game series too). She joined our community and continued to put her focus on strength training, and made sure she ate enough to fuel her workouts. She also sought out professional help for her eating disorder and body dysmorphic disorder. And just focused on getting really strong with those movements! Over the following six months, she strength trained like her life depended on it, keeping track of her gains and making sure she ate enough to continue getting stronger. She learned the movements, took tips from others, and constantly checked in with the Nerd Fitness Community. She raised her deadlift from 135 pounds to 315 pounds, added 50 pounds to her overhead press and 50 pounds to her bench press. You’re probably wondering what happens to a woman’s figure when she goes through this transformation and puts on even more weight. Allow me to show you! Believe it or not, Staci is 11 pounds heavier (142 pounds) in the picture on the right (May 2011) compared to the picture on the left (131 pounds, October 2010). Okay, maybe not magic. 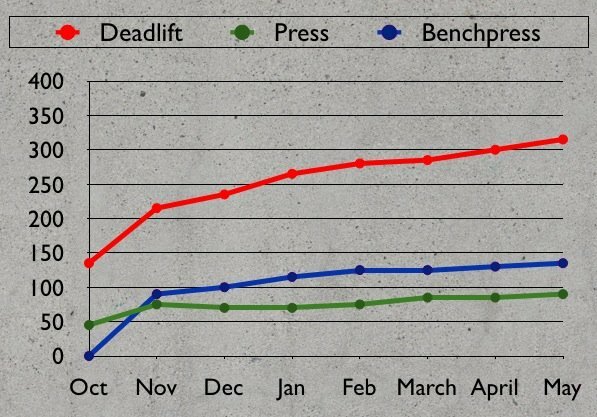 It’s time to bust the worst and most pervasive of the myths relating to women and lifting. So how did Staci gain weight, then? BECAUSE SHE WAS TRYING TO. On top of super heavy strength training, Staci was eating 3,000-4,000+ calories per day (all healthy calories, mind you) to put on the extra weight. YES, when you lift weights, your body shape WILL change. When you work out and lift, you’ll develop a body that looks more like an athlete – which may not be the super skinny Kate Moss look, but it’s a naturally healthy look. Although she was training in CrossFit for 2+ years (you can read about our thoughts on CrossFit here), after hitting a goal of competing at Regionals in 2012, she decided that she just LOVED lifting heavy, and switched to training on her own, focusing mainly on strength, with some fun conditioning like swimming mixed in here and there. For the next four years, Staci continued to pick up very heavy weights, eat more calories than most men, and really focus on getting stronger. Surely this is when the whole “women who lift weights get bulky” myth gets proven correct…right? A) Did she become a yoga fanatic? B) Did she keep powerlifting? C) Did she fall in love with gymnastics? Building a solid foundation of functional strength allowed Staci to work on other skills and pick them up quickly. My overall goal, sport-specific aside, is to be able to do whatever I want to do whenever I want to, without warning, without my body holding me back. And by that I mean if a friend calls me tomorrow and says, “I found a secret treehouse in the middle of the woods, but we need to hike a gigantic mountain and bike 50 miles to get there,” I want to be able to say “I’m in” without hesitation. So I always want to push my body’s limits. Plus, it’s fun! I really enjoy competing sometimes, but my main goal isn’t to be the best at one sport – I have too many goals I’m working towards! Staci can do all of the above because she built a foundation of functional strength. She got really strong at big movements like the squat and deadlift, and bodyweight movements like push-ups and pull-ups. She cut her body fat percentage so she wasn’t carrying around excess weight. She taught her body that being strong feels good, and learned that being strong makes her happy. She slowwwwwly progressed with each exercise, and had a strong foundation to start with! She followed very specific progressions when it comes to gymnastic rings. She followed a progression when it comes to handstands. She had a yoga routine to follow (we have a whole course starring Staci with fun yoga routines). She also had help! Although she learned a lot on her own, Staci over the past 7 years has worked with different coaches and trainers to learn specific skills or improve her ability in certain movements or lifts, as well as help her with proper programming and periodization. After all, a coach can be a game changer and having somebody who can check your form and offer guidance is like turning on cheat codes for strength gains. So that’s where she’s at now, but there’s a big question I haven’t answered yet: Just WHAT was she eating to fuel these workouts? After all, we know from Nerd Fitness that nutrition is 90% of the battle when it comes to strength gain and/or weight loss! Every Sunday (or whatever works, but usually it’s Sunday) I cook a few pounds of chicken. I then portion it out and keep them in Ziploc bags. If I don’t have time for that, you can get all-natural precooked sausage (both chicken and pork) that works just as well as a “bring to work” meat. 7:30AM on my way to work: apple or pear. 9:30AM sweet potato with cinnamon. I keep them at work, and cut them up, throw it in the microwave for 5 minutes with cinnamon. Comes out amazing. 12PM lunch: two of the bags of chicken I precooked and a bag of the Steamfresh vegetables. The entire bag is about 3.5 servings of vegetables. My favorite is broccoli, cauliflower, and carrots. Lunch 2: spinach salad with shrimp, red peppers, green peppers, red onion, lemon juice. 2-3 snacks in the afternoon. Could be one of these: Apple with almond butter, bell pepper (I eat them like apples… I’m weird), carrots (they even make carrots cut like chips), bags of chicken (yes, those bags of chicken I consider a snack as well, not just a meal), a zucchini (yes, plain, raw, uncooked), celery with almond butter and raisins, strawberries, frozen mixed berries. 7-8PM dinners: meat (steak, sausage, shrimp, salmon, or chicken) with some of the following: red peppers, green peppers, red onions, broccoli, carrots, cauliflower (Steamfresh bags! ), and/or summer squash and zucchini. Every once in a while I make something awesome, like this (but really, that takes a lot of time). When I DO make something like that, I make it in bulk and will eat it for the week. Seems like an absurd amount of food, right? That’s because it IS an absurd amount of food. This is what Staci does day in and day out in order to gain weight so that she can lift heavier weights. However, Staci discovered in 2013 that she had Hashimoto’s Thyroiditis, an autoimmune disease that messes with your thyroid. This diagnosis explained a lot of the struggles she had dealing with random weight gain and anxiety, but it was something she had to address. Although it put a strain on her training, she addressed the disease with her doctor – who initially tried to treat it solely through medication – by actively tracking her nutrition and following a VERY specific type of nutritional strategy (while being monitored by her doctor). This lead to Staci following a strict auto-immune Paleo protocol for food: meats, veggies, and berries. The autoimmune part of Paleo cuts out nuts and seeds, nightshades (tomatoes, onions, peppers), and eggs. After experimenting with this diet, Staci slowly started re-introducing foods and developed a diet that works best for her. Now Staci eats meats, vegetables, dairy (but only whole and organic grass fed), fruits, eggs, and rice. She doesn’t eat gluten or soy anymore, no matter what. This may sound restrictive, but she really enjoys it and feels better than she’s felt in her entire life. She also became a master batch-meal-cooker, preparing her meals for the week step-by-step. STACI: The thing is…I don’t. Once you’re off of all of the sugar and processed foods, you don’t even think about it. I got ice cream the other day, which has always been my huge weakness, and it was so sweet that I actually had to mix it with berries and even ended up throwing some of it away. It always bothers me when people will be like “come on, why don’t you live a little!” when I’m out to eat. I’m eating this way out of choice, because I want to. I LOVE steak, I LOVE shrimp, I LOVE broccoli – why would I eat pasta or pizza when I can have any of those? Processed food actually tastes fake to me now, and I don’t feel good afterwards. I really, truly, actually do not want it. STACI: Sure, it can be, but I made it a priority in my budget. 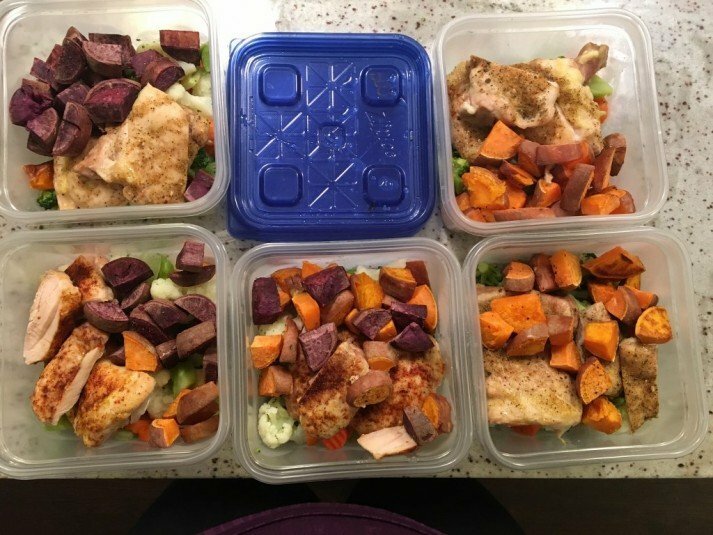 Batch cooking and meal prep saves a lot of money and actually makes it cheaper to eat this way. But also, to me, feeling amazing and being healthy is more important than having 1,000 channels, getting the newest gadgets, or living in the most luxurious apartment. Plus, I save A LOT of money by not going out drinking. Also, healthy eating doesn’t need to break the bank! Sure, Staci changed physically, and her attitude changed, but how she thought about the gym changed too. I know it sounds silly, but that little mental change really does make a big difference, especially if you keep doing it. I’d be remiss if I didn’t mention something else Staci did that was really powerful: she evaluated the relationships in her life and leveled those up too. STACI: Most people have been super supportive, but others definitely think that I’ve gone too extreme. I learned to drown out the voices pretty early, and just do what I felt was the best for me. With diet, I remember the first few people I told about Paleo definitely were not supportive and were more worried than anything. I started telling people that certain foods just “didn’t sit well with my stomach” or that I was allergic (turns out, it was sort of true). It worked great. Staci has also had to deal with really negative people that couldn’t deal with her healthy evolution and she had to sacrifice them (not literally!). I’ve known Staci through nearly this entire journey because she became an active member of our community at the very beginning. Her transformation over these past 7 years has been awe-inspiring. Watching her go from shy message board poster to veteran team member and now lead female trainer at Nerd Fitness has put the biggest smile on my face. Shed discovered strength training and started learning how to get stronger. She learned how to do a squat, deadlift, bench press, and other basic strength moves like push-ups. She used 20 seconds of courage to start training in a commercial gym, quickly realizing that she had every right to train with the guys in the free weight section. We know that “appearance is a consequence of fitness.” Rather than worry about her weight and how it fluctuated on a daily basis, Staci threw away her scale and only focused on getting stronger. 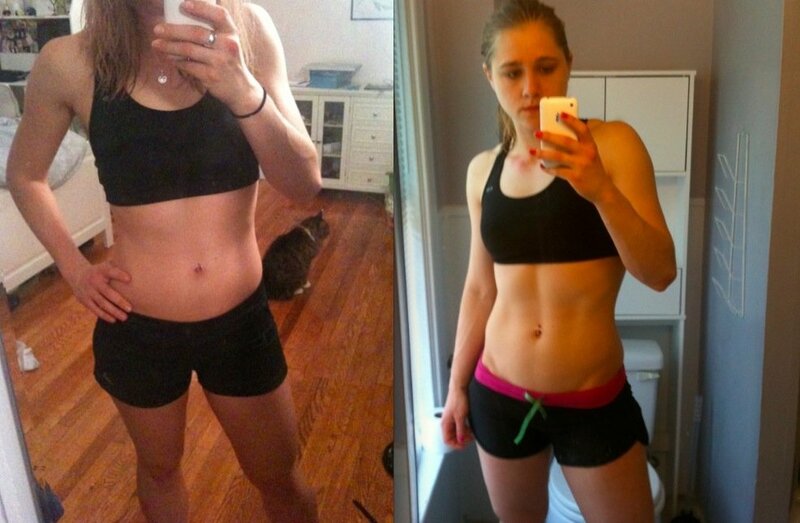 She tailored her meal plan (which is quite extensive) around getting stronger. She understood that it is ALMOST IMPOSSIBLE FOR WOMEN TO GET TOO BULKY FROM LIFTING WEIGHTS (and “bulky” is quite subjective anyway, right?). 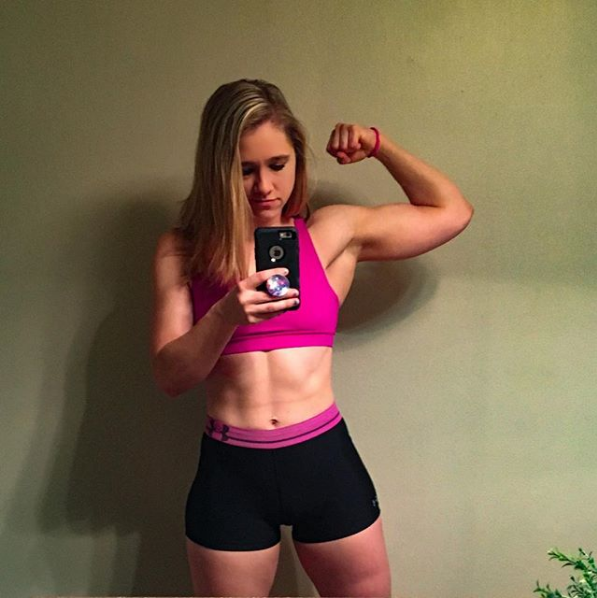 So she simply tracked her workouts and tried to get stronger each week, knowing that her appearance would change as a result of this strength. I’d say it worked! What you eat will be 90% of your success or failure when it comes to fitness and health. Staci tried the “eat way less food” method of weight loss, and it turned her into a sickly person with an eating disorder who struggled with 5-pound dumbbells. She got professional help to overcome her disorder, educated herself on nutrition, focused on consuming the right foods for her body, and now no longer worries about how many calories she eats. She has boundless energy, way more confidence, and is happier as a result. When she was diagnosed with an autoimmune disorder called Hashimoto’s Thyroiditis, she worked with her doctor to treat the problem through a strict nutritional strategy rather than just resorting to medication and pills. It required a fairly large pivot, but Staci will tell you that feeling strong and healthy is worth it. Staci is a nerd like you and me, which means she loves numbers and stats. You can go back through her old posts on our message boards and see exactly how much she was lifting and how she was training over the years. She tracks every one of her workouts she’s ever done, and can always refer back to them! Staci jumped headfirst into the Nerd Fitness community, asking questions about strength training, participating in our monthly challenges, and asking for support in her quest to live a healthier life. 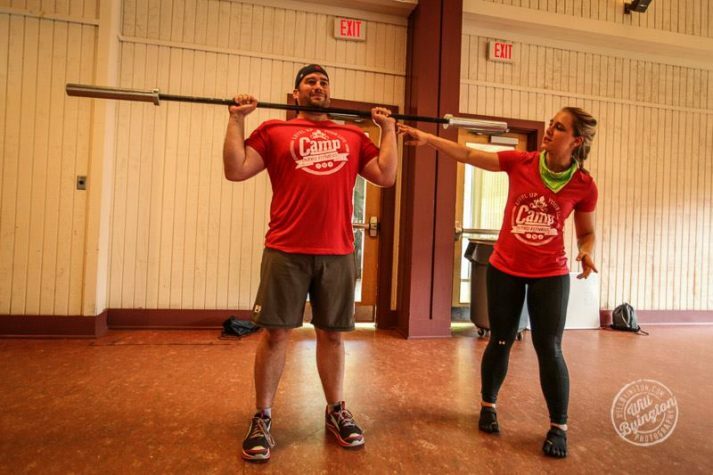 She has since joined our team, became a lead trainer for our 1-on-1 coaching program, is a huge presence in the online community for the Nerd Fitness Academy, and has made friends in gyms across the country. And thanks to this success story, she’s inspired hundreds of thousands of women to start strength training! Look at Staci’s training regimen in 2019: gymnastic rings, handstands, yoga, swimming, powerlifting, bodyweight training, and Olympic lifting. In 8 years, I have seen Staci evolve and adapt her workout program dozens of times. While many people miserably run on a treadmill and go on a diet until they reach their goal weight (only to put it all back on) …Staci was different. She understood the concept that “you never get to be done, so you might as well enjoy the journey.” Staci doesn’t HAVE to go to the gym, she GETS to go to the gym. It makes her feel alive. Learning new skills and having new goals consistently keeps her on target and working harder to live better. You never get to be done – so don’t go on diets or follow a workout program you hate. Pick activities you love and get addicted to progress. 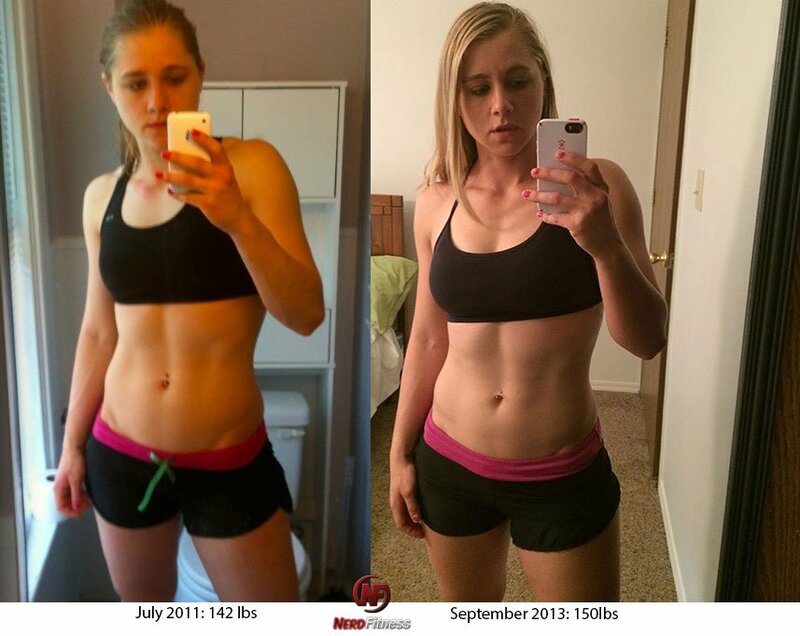 Staci got hooked on picking up heavier and heavier weights, and now she’s hooked on seeing what her body is capable of! “Staci is so awesome. I want to be like her when I grow up, even though I’m older than her” is something you might be saying right now. STEP 1: Get started with bodyweight training by following our Beginner Bodyweight Workout Routine, until you can complete the routine completely. STEP 3: Read our complete guide on how to train in a gym! Head to a gym and complete your first strength training routine! STEP 4: Repeat and try and learn and do and mess up and pick up slightly heavier things and repeat and try and fail and succeed and learn a lot about yourself in the process. It’s the journey, not the destination; enjoy it! Know that you’re not alone on this journey. We have a community of hundreds of thousands of people all over the world that want to help you! But we can only help you once you decide to get started. Don’t worry, I got you covered there too! Consider our 1-on-1 coaching program where we’ll build a powerlifting and nutrition program for you based on your situation and current level of experience, with video form checks and expert guidance. It’s how Leslie, a single mom, lost 100+ pounds! On a bit tighter of a budget? No problem! Check out our self-paced online course, the Nerd Fitness Academy, which eases you into strength training with both bodyweight and gym routines. I don’t care how you get started, just that you start! Obviously we know this Weight Watchers employee doesn’t reflect the beliefs and views of all employees at Weight Watchers.